We’ve all heard the phrase “He’s no spring chicken,” meaning someone isn’t as young as he used to be. So we know what a “spring chicken” isn’t, but what is it? Being a lover of old cookbooks, I recently decided to make Chicken Célestine, a late 19th Century recipe also served by the great chef Fernand Point at his restaurant La Pyramide near Lyon which opened in the 1920s. Chicken Célestine (after translation into English) calls for “spring chicken.” However, the French title uses the word “poulet” which, according to books of the time, describes what was then known in the US as a “broiler,” a young chicken, 2-3 months old and weighing 1½-2½ pounds. The reason it’s important to use such a young chicken in this dish is, the cooking method. It is braised for only about 15 minutes and so needs to be small and very tender to cook so fast. When I went out to purchase a chicken of the required size and youth, I quickly discovered that the smallest whole chickens available at any number of supermarkets and gourmet shops in my area weighed at least 3 or 4 pounds. Even the venerable D’Artagnan, source of exotic meat and game birds for food lovers everywhere, doesn’t have any chickens under 2¾ pounds. Due to changes in the poultry industry, the USDA has changed these classifications. The invention of battery farms, the use of antibiotics, and selective breeding all mean that chickens grow a lot faster than they used to. So as you might expect, they are slaughtered younger than they were in Julia’s time. You can read the current USDA poultry classifications here. One thing puzzles me, the USDA has combined the first two categories, creating something they call a “broiler-fryer” which is under 13 weeks old. No weight range is given, but this bird is supposed to have a very flexible breast bone which indicates youth. Epicurious’s excellent “Food Dictionary” entry on chicken says that broiler-fryers can weigh up to 3½ pounds. From what I saw on my shopping trip, it seems there aren’t very many true broiler-fryers out there and if you’re looking for and old fashioned “broiler” as defined by the old rules, good luck with that. Fortunately, for us historic recipe geeks, there are other options. In Mastering the Art of French Cooking, Julia Child mentions another category of chicken, namely the “squab chicken” or “baby broiler.” This is a very, very young chicken at 2 months old and weighing in at ¾ – 1 pound. She writes that this is equivalent to the French “poussin” which is available through our friends at D’Artagnan. Another possibility for cooks who want a young (and thus very juicy and tender) bird is the Rock Cornish hen, also called a Cornish game hen. They fall right between the “squab chicken” or “poussin” and the “spring chicken” or “broiler” of old at 4-6 weeks in age and a weight of up to 2½ pounds. The Rock Cornish is a hybrid breed created in the 1950s by cross breeding Cornish roosters, and White Plymouth Rock hens. Alphonsine Davalis Makowsky, a French-American chicken farmer, is credited with the creation of this hybrid which was immediately seized by fine restaurants all over the US as a way to serve a whole bird as a single serving of tender, succulent meat. I am still left with the question, “Why are there no old style “broilers” available anymore?” Is it the growth of portion sizes in the US? Have home cooks lost the knowledge of the different sizes/ages of chicken and their proper uses? Do the meat companies (Tyson, I’m looking at you) want to make more money and so don’t bother selling small birds, instead using them for chicken parts or processed chicken products? I’d love to hear your thoughts in the comments section. For my Chicken Célestine I chose to use 2 poussin which together weigh about the same as a “spring chicken” or old fashioned “broiler,” I also thought they would fare best with the cooking method. It’s a very simple dish using only mushrooms, a little tomato, garlic and a zesty pinch of red pepper in a white wine sauce, to bring out the delicate, sweet taste of the spring chicken. Served with rice and a bouquet of daffodils on the table it just might transport you. Melt the butter in a large deep saute pan. Stir the butter until it turns a nut-brown color. Add the chicken pieces to the pan and cook them over medium-high heat, turning so they brown evenly. When the chicken is browned, add the mushrooms, and tomato, stir to combine and cook for 5 minutes. Next add the Cognac, wine, and chicken stock, and red pepper flakes. Then season well with sea salt and freshly ground black pepper. Adjust the heat so the wine sauce is simmering, cover the pan and cook for 15 minutes or until the chicken reads at least 160F on a thermometer placed in the thigh. Remove the chicken to a hot platter and cover it with aluminum foil so it can rest while you make the sauce. Skim the fat from the top of the sauce or use a fat separator. Sprinkle ½ the chopped parsley into the sauce along with the minced garlic. Reduce the sauce until it coats a spoon. Taste, and adjust the seasoning with salt and pepper if necessary. 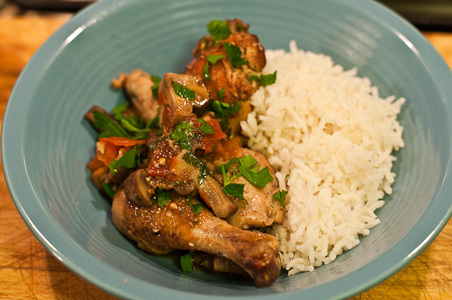 Spoon it over the chicken, sprinkle on the rest of the parsley, and serve with rice. You can get sometimes small organic chickens here in the UK in the supermarkets that are the equivalent of broilers but i have always found them rather bland in flavour so I’d rather have a 4lb one as its so much more tasty. Hi Linda, thanks for visiting. It’s too bad those little chickens turned out to be flavorless. In her “To Roast a Chicken” episode Julia praises the “roaster,” which in her day was 5-1/2 to 9 months old and weighed 4-7 pounds, as the most flavorful chicken. She also complained that it was hard to find them in the markets then. Yes, I thought it was a really cute chicken too. 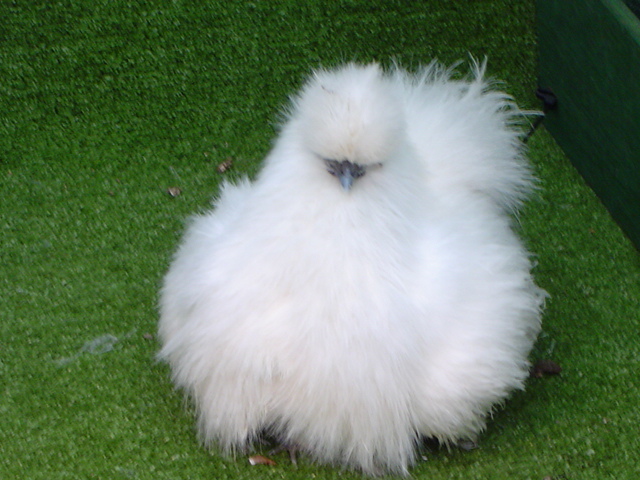 The breed is called Silkie Bantam and they are all fluffy like that. It’s sort of like a living feather boa or something.